The safest way to keep me from spending money in a thrift store is to simply bar me from entry. 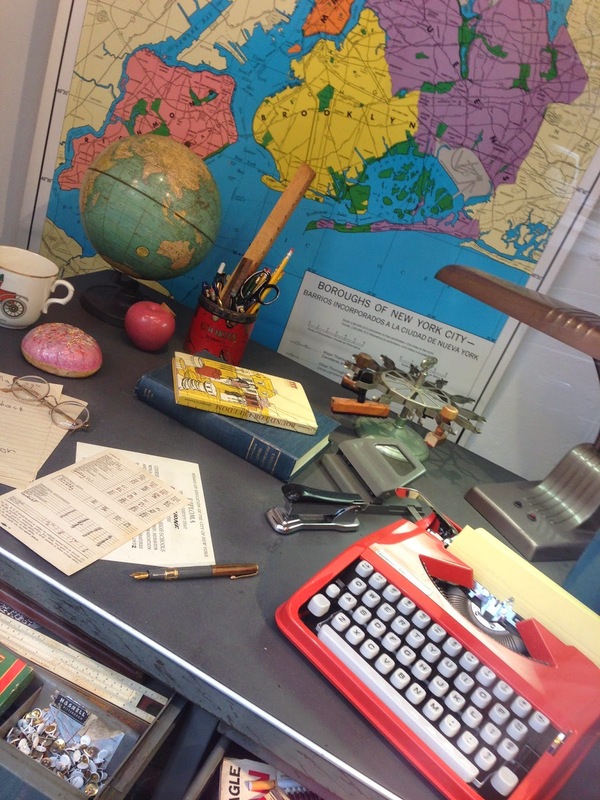 But who says I can't peruse the windows, especially if they're showcasing the wares at one of my favorite haunts in New York City, Vintage Thrift. 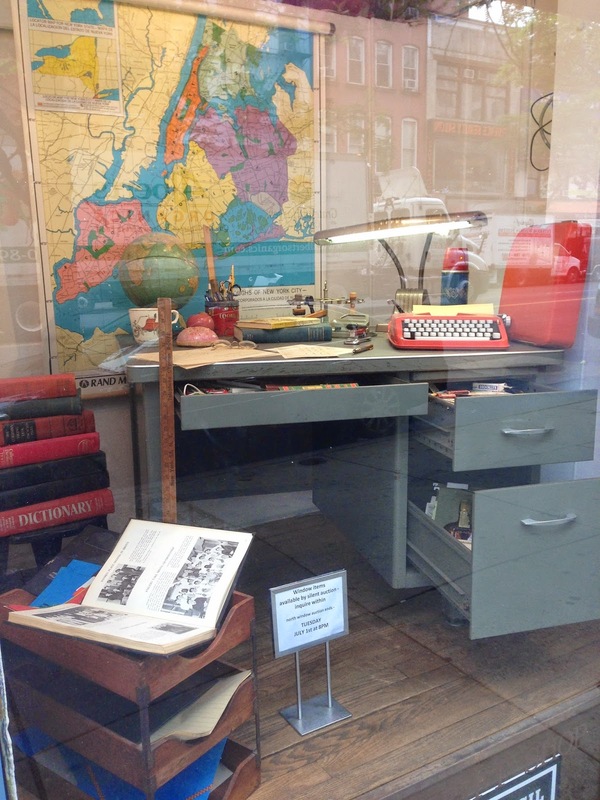 I wasn't planning on walking by Vintage Thrift this morning, but when I did, how could I not be mesmerized by its windows: the bright vintage typewriter, the carousel holding stamps, the school grade cards and the old metal desk lamps? But wait, the drawers are open! 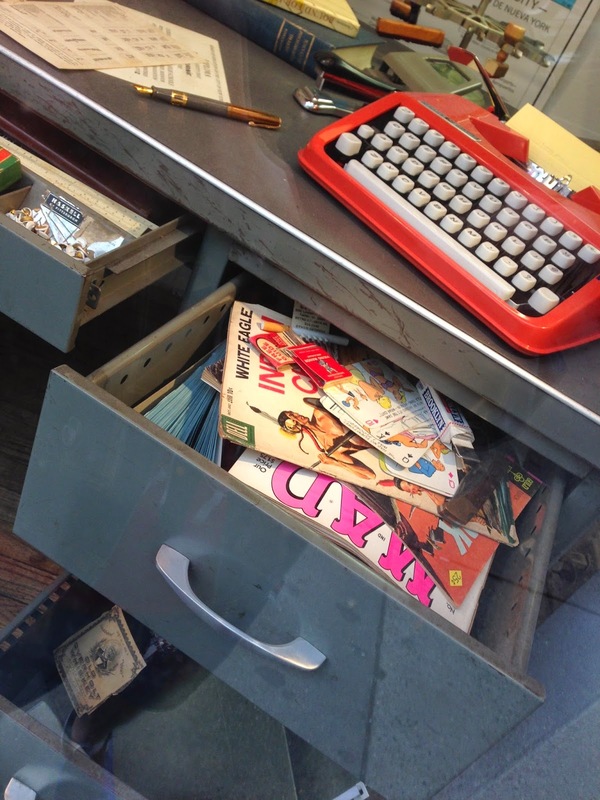 Just take a peek at all those old vintage desk supplies inside. 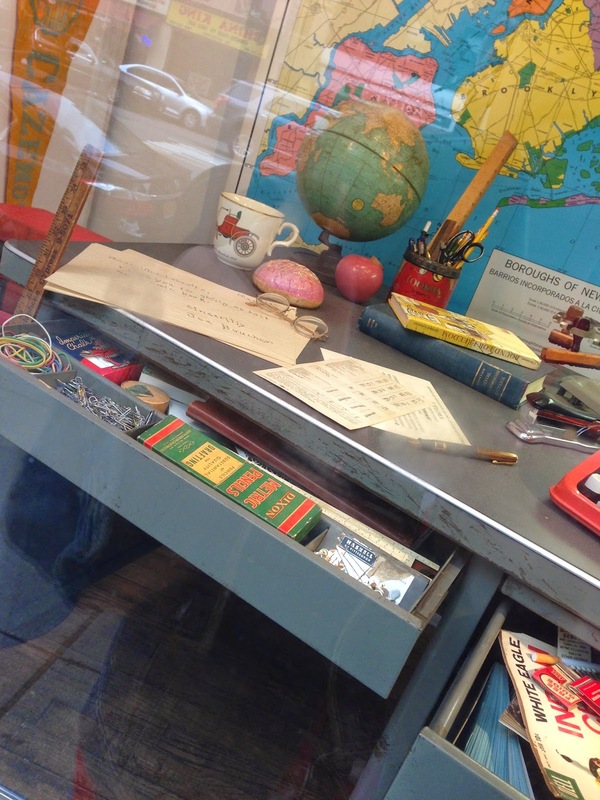 It's as if this desk was picked up from a school in the late 1960s and placed right in the window. 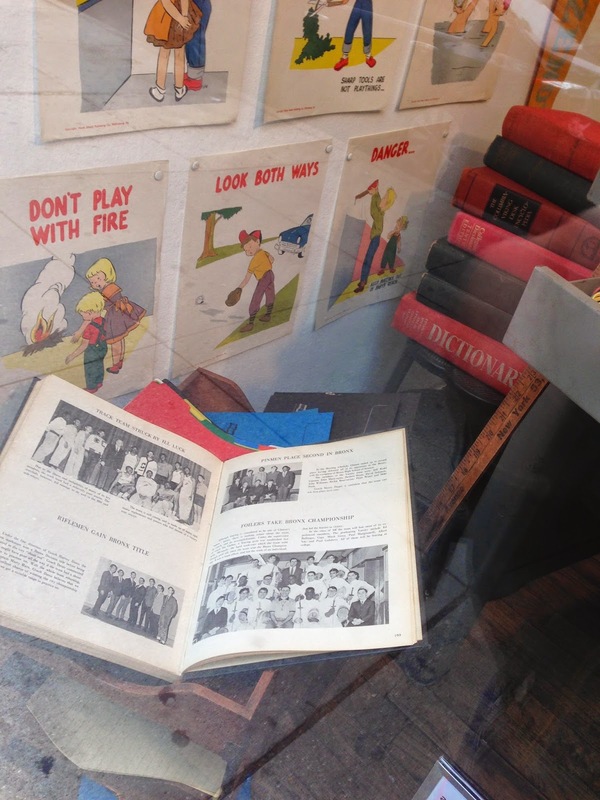 For some off-duty reading for this teacher (or principal), there's a comic book, a deck of cards and a MAD magazine. And finally, there's a peek into the school yearbook with one of the funniest headlines I've ever seen, "Track Team Struck by Ill Luck." But for me, today was a very lucky day! Oh yes! It is I, right between Bert and Ernie! Taken back in the early 1990s when I was an editor at the now defunct Children's Business at Fairchild Publications, this Polaroid image take me back the day of wide ties and (eek) pleated pants. While I'm usually pretty astute at remembering why and what I was wearing at the time of a photo, these choices have me completely at a loss for explanation. Do take into consideration, though, that this was taken just before the concept of flat-front trousers picked up in the mid-to-late '90s. It was also the first time goatees became popular after a long respite, but before the days we had the correct tools to keep them neat and trimmed. I do remember those fancy Giorgio Armani glasses that came with clip-on sunglasses, which, by the way I lost and replaced three or four times. And wow! I really did have hair. See for yourself! As for Bert and Ernie, Bert still has his unibrow, and they both have hipster 'dos, high on the top and sheered on the sides. And to this day, these two Muppets still show their stripes, both vertically and horizontal. Thank goodness some things never change. Tea? For 25 little girls? No problem! 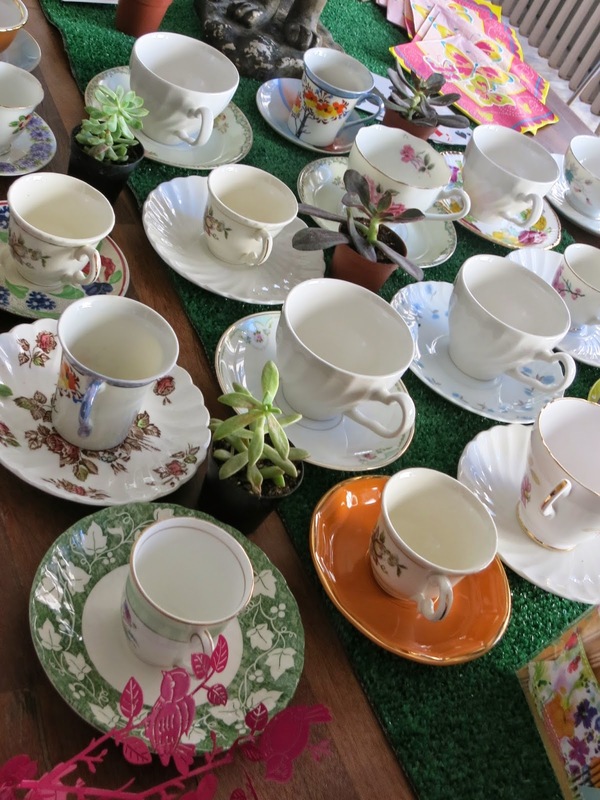 It all started when my good pal Allison Hemming of The Hired Guns asked me where to get inexpensive tea cups for a Mad Hatter birthday party for her seven-year-old daughter, Fiona. My natural response? 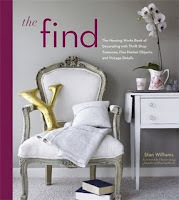 Thrift, of course! 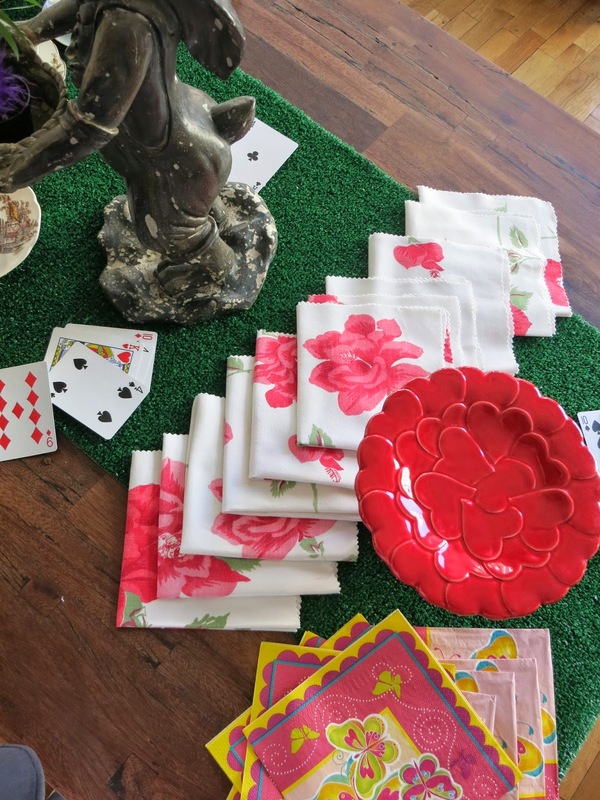 For the tabletop, Allison and I used pretty much what we had on hand: playing cards, metal bird; odd dishes; vintage linens, garland, children's toys, novelty salt and pepper shakers, you name it! 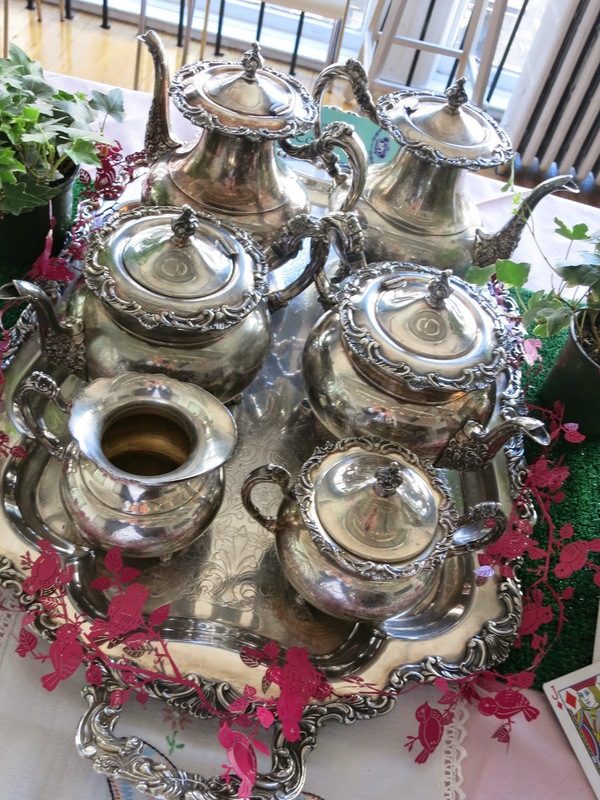 Allison's mother's gorgeous silver tea set shimmered as a focal point, especially after Allison gave it a hearty polish. Allison bought green Astroturf that we cut into lengths to create runners for our extra-long serving tables that enhanced the garden them. 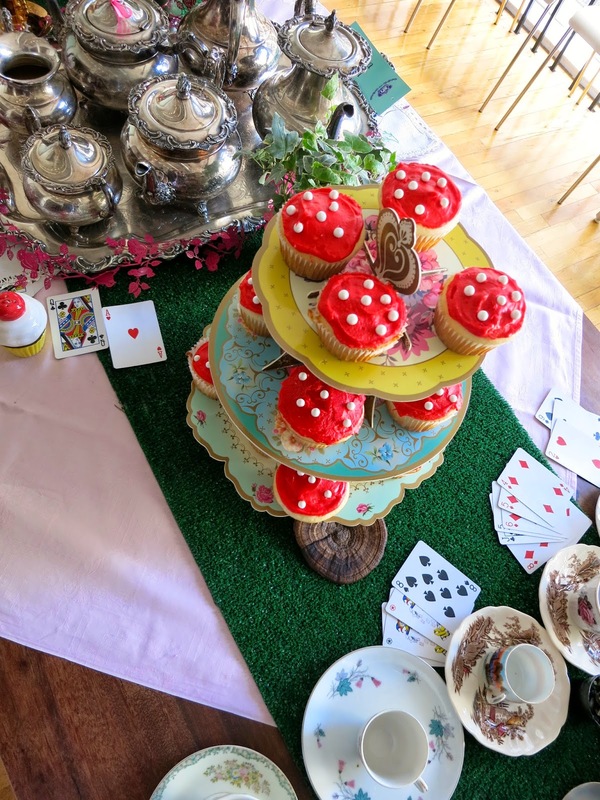 One mother made magical mushroom cupcakes that we displayed on fanciful cardboard tiers found at Penelope Wurr's adorable shop in Brattleboro, Vermont. Look closely and you'll see a real mushroom that Allison found in the woods near her home in Jamaica, Vermont. 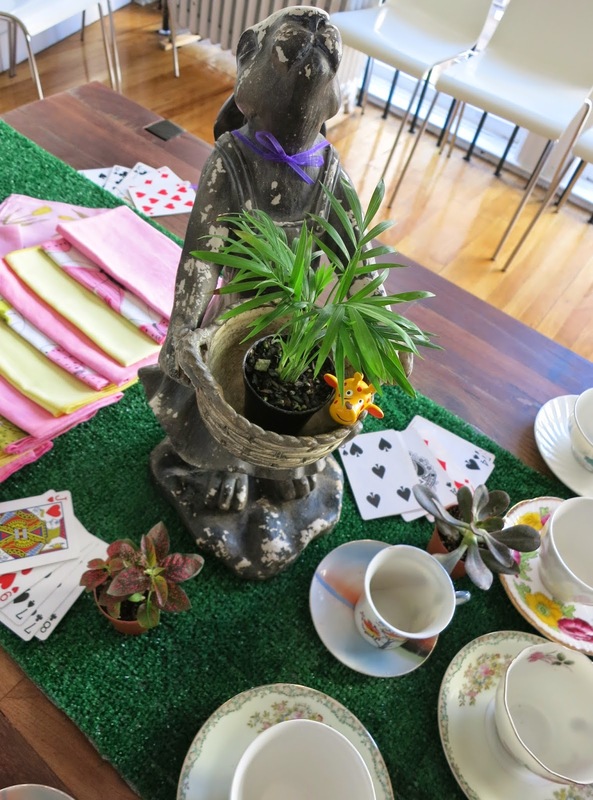 A pair of lawn ornament bunnies from Allison's Vermont home were transformed into table decorations. My mother whipped up these colorful, casual napkins out of a favorite, thread barren vintage tablecloth. She simply cut them into squares with pinking sheers. 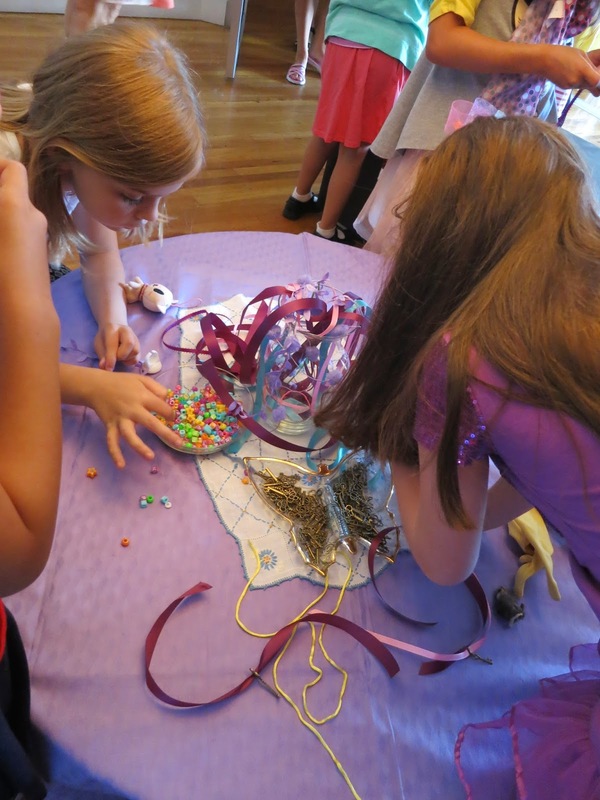 What's a party without an activity? 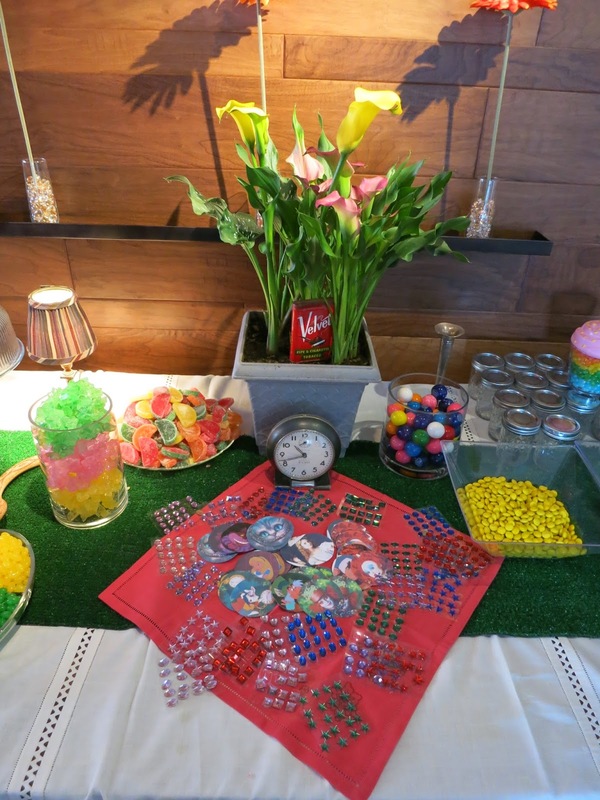 Here, party goers were invited to customize Mason jars with press-on gems and paper Alice in Wonderland characters and then fill them with Jelly Bellys, M&Ms, gum balls, rock candy and candy fruit slices. 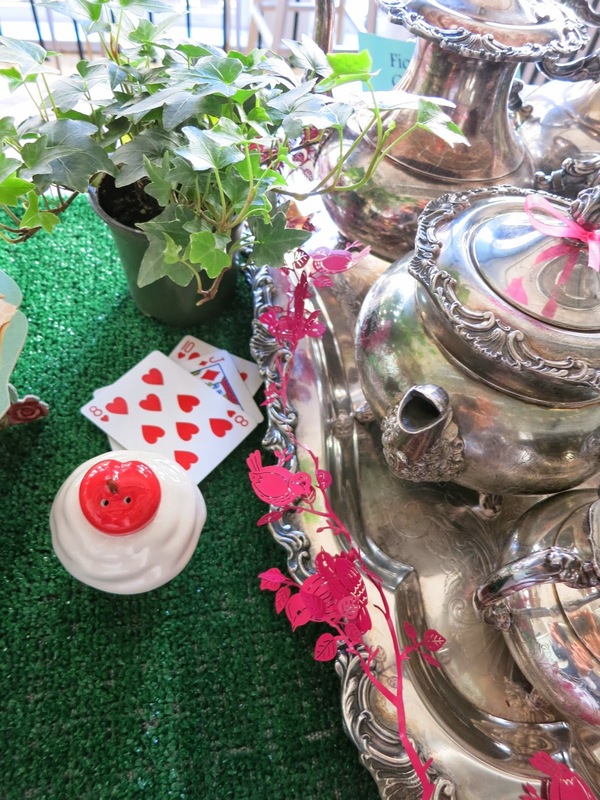 I placed another Astroturf runner atop a vintage white tablecloth to keep our theme consistent. Talk about a sugar high! 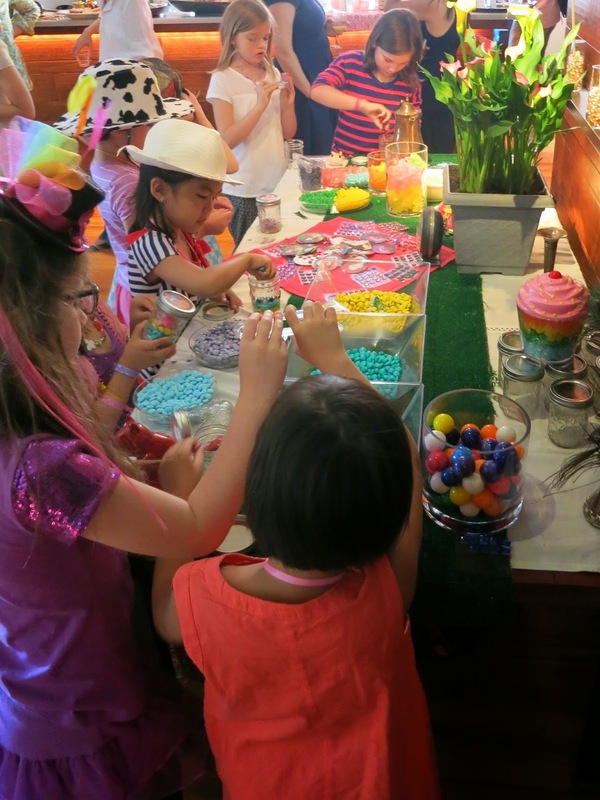 These party girls are at work filling their jars with treats. A second activity centered around making necklaces with strands of ribbons I have collected over the years and tiny metal keys that I bought on Etsy. 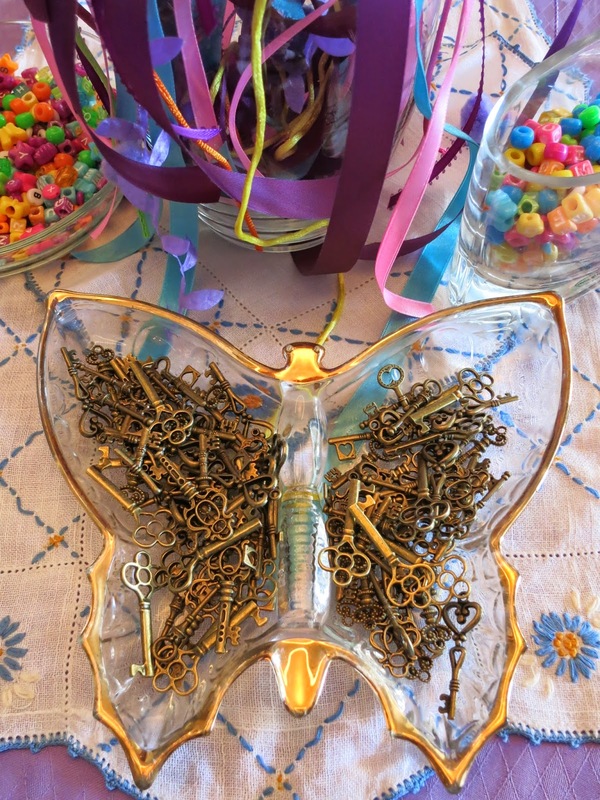 I place the keys in a butterfly dish I picked up years ago for $1.00 at The Red Racks Thrift Store in Independence, Missouri. Witness all the craftiness at work. 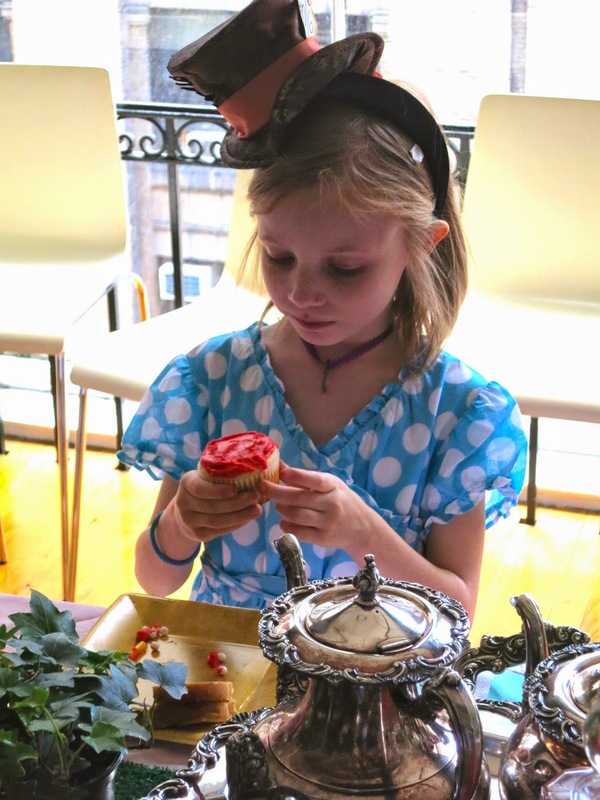 And here is Miss Fiona wearing one of the necklaces and sampling a cupcake. What a mad, mad, mad, mad, mad day of fun!